Indian Beauty Blog | Fashion | Lifestyle | Makeup | SparkleWithSurabhi : Karvachauth Madness - 2nd November. Karwa Chauth is celebrated mostly by the married women in North India. On this day, they observe a fast, praying for the long life, well being and prosperity of their husband. They break their fast in the evening, after moonrise. On this sacred festival, people come together and socialize with friends and family, exchange gifts and share home-cooked meals. It also provides an opportunity to all married women, to get close to their in-laws. Karwa Chauth is the festival which reflects joy, splendor, brightness and happiness of a married life. The festival of Karva Chauth is symbolic of the unflagging loyalty of a wife towards her husband. It is celebrated nine days before Diwali, or the festival of lights, on the fourth day of the waning moon in the Hindu month of Kartik, around October-November. Married women, old and young, begin their fast on the day of Karva Chauth, well before sunrise (around 4 am), and have food and water only after spotting the moon, which generally rises at about 8.30 p.m. The women strictly adhere to the guidelines laid down for the fast and give up food and water for one complete day. In spite of being one of the toughest fasts, karva chauth is the most awaited festival of the year and is welcomed by married woman with great fervor. For a newly-wed woman, karva chauth is particularly special, as they get decked up in their bridal lehnga-choli. The things that symbolize and reflect the marital status of a woman, such as jewelry, bangles, henna, bindi, lehenga choli and many other traditional gifts are in high demand on this special occasion. Usually, women receive beautiful gifts from their husbands and relatives on this day, as a gesture of their love and care. 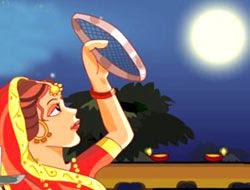 This year (2012), Karwa Chauth will fall on 2nd November.